Somebody described me as a cucumber the other day. I took that as a compliment. I adore cucumbers, of all kinds. But growing them is another story. For the last couple of years I’ve focused on one variety – the Marketmore. They live up to their name (as in, you get lots) and the ones I have growing, I propagated from seed, which makes me very happy. 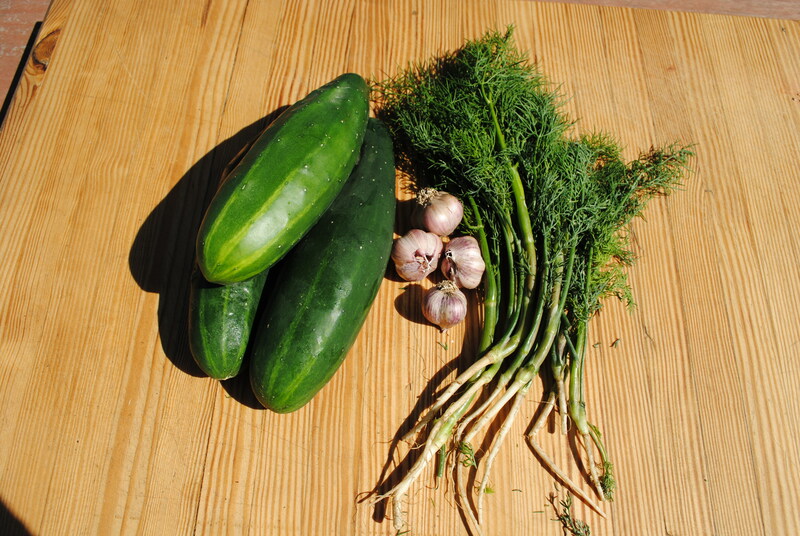 This is a short post, because I’m worn out with finding things to do with garden produce. So this is about what to do when you have so many cucumbers that you lose your cool. What you do is make Dill Pickles. Technically you should use cucumbers that haven’t matured. Bugger that. I use mature cucumbers, as it’s pretty much the same but you don’t have to sacrifice the cucumber equivalent of lambs. Once again, dear Margaret comes into this story. 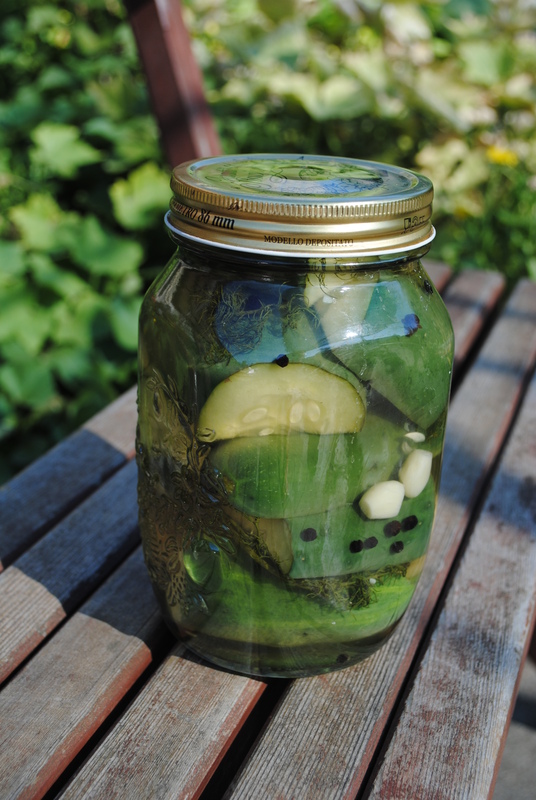 But also a love of Dill Pickles (perhaps from my time spent in the US before it became an environmental eyesore). And a penchant for Jewish/Polish/Scandinavian food, which is hellishly muddled, and not for me to extrapolate upon here. Suffice it to say, I really like pickled cucumber. So, I planted three Marketmore plants (which I grew from seed – did I mention that?) and since mid-January we’ve had three to four cucumbers a week. Imagine if you had five or six plants? Marketmore is an understatement. So, today, I pickled some (not without thinking upon this last night, as you need to leave them in iced water for 24 hours). Here’s the easy recipe, based on dear Margaret’s method, with my own embellishments. Cover the cucumbers with water and refrigerate for 24 hours. Drain, and prick all over with a skewer. Put lots of dill, then cucumbers, and garlic, then more cucumbers (I slice them up) into a sterilised jar. In the meantime, boil the vinegar, salt, peppercorns and sugar, and pour into the jar until the cucumbers are covered. Leave for as long as possible. Eat when the thought of a cucumber is so unseasonal as to be laughable. Damn that looks good. Now, you’ve just got to wait three months or more, until it’s worth pricking that bubble of anticipation. Prepare a few jars and the wait gets just that much more unbearable. Delicious with cold meats, cheese, or just on their own. I know this is all very ‘make hay while the sun shines’, interspersed with more of the serious stuff. BUT I read today, in the face of the Monsanto push into the Land of Oz, that 53% of Australians grow at least some of their own food. That, my friends, is something to be proud of, and more power to you. Last year I heard that, in the context of a general global downturn, organic food production in Australia had grown by 15%. We’re a weird mob, there’s no doubt about it.